As I am still travelling around the US after the recent Rootstech Conference I have to rely on hotel internet connections so I may not be able to post links to Reader Geneameme responses promptly. I will, however, do my best. Pauleen Cass from Australia's Northern Territory was the first to respond to the meme challenge followed by Julie Goucher from the UK. Thanks for getting the ball rolling. Following is the list of links to responses; I will continue to add to this as I find more contributions. It's National Year of Reading in Australia - time to post a GeneaReader meme. I am always interested to see what the people profiled on GeniMates answer to the question "What is your favourite (non genealogy book)? As books are an essential tool for the genealogist I thought it would be fun to find out about your reading habits and experiences. I invite anyone with an interest in genealogy or reading to participate. If you don't have a blog and wish to participate you can send your responses to me in an email and I will pop them into a post on my blog. Please let me know when you participate by a comment on this post or by email and I'll collate a list of responses. Can you recommend an inspiring biography? Do you keep a reading log? If yes, in what format? Are you a buyer or a borrower of books? Where do you get reading recommendations? What is the one genealogy reference book you can't do without? Do you hoard books or do you discard them when you have finished? How many books are in your genealogy library? What's your favourite genealogy magazine or journal? Where are the bookshelves in your house? Do you read e-books? How? How many library cards do you have? What was the last genealogy title you read? Do you have a traditional printed encyclopaedia in your house? Who are the authors in your family tree and what have they written? Can you nominate a must-read fiction title? How many books are in your personal library? What is your dictionary of choice? Do you have anything else to say about books and reading? Links to Responses to the Reader Geneameme See what other genealogists have to say about books and reading. I just came across this draft post from the recent Rootstech Conference that I had neglected to publish. It contains photos of more of the amazing people I met there. A number of the people with whom I communicate on various social media are starting to share their excitement about attending this event which is only held once every three years in Australia. Some like me are first time attendees while others including Judy Webster from Queensland have attended nearly all of the twelve previous Congresses that have been held at various cities around Australia. I have noticed Cassie Mercer from Inside History Magazine and Alona Tester from Gould Genealogy tweeting about Congress. Earlier today on Twitter I proposed that when tweeting about Congress we should use a hashtag. Alona Tester was online at the time and we entered into a conversation on this topic. We agreed that we would use #AFFHO12 whenever we posted tweets about Congress. Hopefully other genealogists and sponsors who are attending the Congress will also use this hashtag so that posts can be easily identified. I have put a note on the Australian Genealogy group on Facebook asking the 700+ members there if anyone is attending Congress. Hopefully some of the people in that group are heading to Adelaide and will share their excitement in their Facebook genealogy groups. There are a number of Australian genealogists using Google Plus. Another first time attendee, Liz Pidgeon (aka @infolass) has used that medium to indicate that she will be attending Congress. If you are attending Congress please let me know - I'd love to catch up with you there. 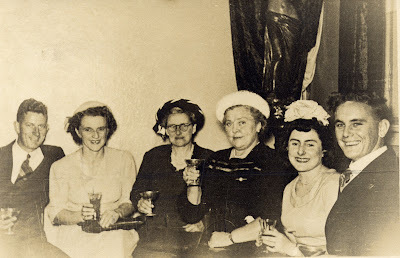 I should imagine from looking at this photo that it was taken at a function in Sydney in the late 40s. It may have been at the wedding of Merle and Merv Faunt at All Saints Church, Petersham in June 1948. From Alona Tester comes this great idea for Congress. Congress provides an opportunity to meet new people - be prepared with cards to swap your contact details. As a newbie I am not sure what I should pack for Congress in Adelaide. Tourist sites tell me that the weather in Adelaide will be mild in late March so I won't need my thermal underwear or my sundresses. As conference venue airconditioning can be unreliable I will be dressing in layers and wearing flat comfortable shoes. I'll need some cash for those vendors who may not offer credit facilities in the trade fair/exhibit hall as I am sure there will be lots of goodies for sale. As always there will be a bottle of water in my conference bag and maybe some healthy snacks. *Galaxy Tab another option for connecting, tweeting and blogging from the conference. * Small portable hard drive on which I have all my family history data. One never knows when one will meet a cousin. * Digital camera, SD cards, 2 batteries, charger - This Official Blogger wants to take lots of happy snaps for the blog. I will back up any notes taken to this device. All of this will probably be packed in a bright bag that will stand out in the crowd. Of course I will be taking Mr Geniaus to act as chauffeur. I hope he can amuse himself for a few days in Adelaide. I am wondering if there is anything else I need to take. A little while after I registered for the The 13th Australasian Congress on Genealogy and Heraldry I asked if there was a Social Media Policy for the Conference and if there would be any Official Bloggers at the conference. Since then I have had an ongoing conversation by email with Joan Matthews, Deputy Chairperson of the Conference Organising Committee. Just prior to Rootstech I had a message from Joan welcoming me "aboard as an Official "Blogger" I see that my role has been announced in the latest edition of the Conference Newsletter so I can come out of the closet and start talking about the Conference on this blog. I am very excited to be attending my first Congress as I have heard lots about this event from my geneablogging friends who will attend; these include Judy Webster, Shauna Hicks, Helen V Smith, Alona Tester and Kerry Farmer. I am particularly excited to be meeting Seonaid Harvey Lewis who will be travelling from New Zealand for the event. I note from the Conference website that it is not too late to register for the event so if you have been vacillating about making a decision why not go to http://www.congress2012.org.au/html/registration.htm, register and join us in Adelaide on 28th March for four days of fun. Reading through this list of TV shows reminded me that I should make a note in my database of the shows enjoyed by family members. My grandmother, Ethel Jane Pusell liked Bonanza and Days of our lives. My Dad, Allan John Curry loved Four Corners, The Flintstones and Top Cat. What shows did your parents and grandparents watch? This snap in my Dad's album simply says Eileen and Pat Redding, 1945. They look like a mother and daughter to me. As my Dad lived in Canowindra, NSW I am thinking that the Reddings may have some connection with that town or perhaps Eileen is Eileen Ursula Redding who, according to the electoral rolls on Ancestry, resided at Pacific Highway, Hornsby near my Dad's Aunt and Uncle Percy and Mary MacDonnell. I'm hoping that one day a Redding descendant happens across this post and contacts me. More snaps of the people I met at Rootstech. The best thing about going to Rootstech is meeting one's old genimates and making new ones. If you have a spare few minutes and need a break from ancestor hunting how about responding to one of these geneamemes. Please let me know if you take up my challenge so I can add your post to my lists of links. Watch out for the new Reader GeneaMeme to be posted on the Geniaus blog on February 27. Many of my Aussie genimates follow a number of genealogy blogs from the US. At the recent Rootstech Conference I got to meet a number of the people who write or are mentioned in these blogs. Rootstech 2012 was an amazing experience so much so that my non-genealogist husband has agreed to return for Rootstech 2013 and to set aside more time for research in the Family History Library. I think he has caught the genealogist bug. He spent hours at the Library scanning reels of microfilm looking for evidence of his English ancestors in small villages. He was frustrated that he was unable to knock down a brick wall that may connect us with descendants of James Gowans, the Scottish clockmaker, in New York. There is evidence on the US 1900 census that Mira/Maria Gowans lived on 261 West 20th Street, New York, New York and after that we cannot find a trace of her. At Rootstech Mr Geniaus had access some of the best genealogists in the US and he asked each of them for guidance with his problem but despite following their advice his searches brought no results. Unlike me Mr Geniaus likes to plan far ahead so we already agreed that we will stay on after Rootstech and spend a week researching in the Family History Library and we'll include in our itinerary New York where there is a copy of Maria's mother's probate file from 1902 held in the Surrogate's Court. Perhaps this will hold a clue to Maria's whereabouts after 1902! I think I have a family history convert! Taken at the same time and place, The Police Depot in Sydney in 1947, as the photo of my father in my In the Force post is this snap of another young Police Officer, Keith McDean. Perhaps the photo is in Dad's collection because Keith joined the force at the same time as Dad in 1947. I can only find mention of one Keith McDean in Australia on Ancestry. I wonder if this is Keith William McDean? Hopefully one day this post will reach one of Keith's descendants. Having just watched my first attempt at a video interview I have learnt that I need to sit on my hands and stop pulling faces. Sitting still is not one of my strong points. At the Rootstech conference the Official Bloggers were given an opportunity to book a slot in a glass enclosed studio in the middle of the exhibition hall where we could interview vendors, celebrities and ordinary people just like me. There was a very helpful technician on hand to man the cameras and audio equipment. During last year's conference I was just too nervous to try interviewing anyone but this year I was feeling a little more bold and confident so I gave it a go. As my first victim I selected Darrin Lythgoe, the developer of the TNG genealogy software. Darrin had been very helpful to me last year when I was having trouble upgrading from one version of TNG to the next and I knew that he would be a kind and supportive interview subject ..... and he was. The video is available on Youtube and right below this paragraph. Be gentle with the hand waving interviewer. A highlight of visiting any foreign country is being able to meet, chat and get to know the natives. Attending the Rootstech Conference in Salt Lake City has given Mr Geniaus and I and opportunity to meet US citizens from many states. That they share my passion for family history has been icing on the cake. The networking component of events such as Rootstech cannot be underrated. An invitation to visit a home in a foreign place where one can interact with people and their friends in their own environment offers a great cultural opportunity. On Saturday night, with around fifty other bloggers and genealogy enthusiasts, Mr Geniaus and I experienced the hospitality of Janet Hovorka, the Chart Chick, and her husband in their family home around 40 minutes outside Salt Lake City. We were treated to a Mexican feast and some very pretty sweet delicacies. Janet's local friends in genealogy provided transport for us to the venue. We thank Luana Darby who chauffeured bloggers Thomas MacEntee, Lisa Alzo, myself and Mr Geniaus to and from the party. At the party we got to have some extended conversations with people we had met at the conference and some we had not managed to meet. This event afforded us all a perfect way to wind down after the hecticity of Rootstech. Our thanks go out to the Hovorka Family for this fantastic evening. At a Rootstech after party I attended last evening at the home of the Chart Chick, Janet Hovorka, we sang happy birthday for the 5th of Febrary to Rootstech Official Blogger, Lisa-Louise Cooke. Thomas MacEntee lead the partygoers in a rendition of "Happy Birthday". Although he doesn't do genealogy Mr Geniaus is tapping the brains of the many expert genealogists who are at the conference. Here he is deep in conversation in the Media Hub (Official Bloggers' Hangout) with Dear Myrtle. While most of the Americans at Rootstech's "Friday night at the Library" watched the "Who do you think you are?" TV show at 7:00 pm this evening. I took the option of attending the broadcast of the first birthday show of Geneabloggers Blogtalk Radio. Instead of watching the show at my kitchen table at lunchtime on Saturday in Sydney I joined Thomas MacEntee, co-host, Dear Myrtle, and a couple of other lucky genealogists in a glass enclosed conference room in The Family History Library in Salt Lake City. During the show I was busy Tweeting, writing on the chatboard, taking photos and, on a cue from Myrt, presenting Thomas with a 'surprise' birthday cake. I promised the people on the chatboard that I would post a few photos to this blog but, as it is easier to upload a set of photos to Facebook, I created a Public Photo Album that you can access here. Some people on Twitter asked me if I interviewed him personally or via a link. It was in person and here's a photo to prove it.